To be able to make the most of our short time in Norway, we wanted to fly out after work on a Friday evening. Before booking we needed to make sure we could get into the city late at night after our plane landed, allowing for any delays or problems. We could always of course get a taxi but if cheaper, convenient public transport was available then we definitely wanted to know about it. When I say late at night, we were due to land at 11.50pm into Oslo Gardermoen airport but actually ended up with a 30 minute delay so didn't actually get into the arrivals area until 12.30am. We actually had a choice of flying with Ryanair or Norwegian Air and the prices were very similar but Ryanair was being classic 'Ryanair' and flying into a different airport that looked a bit harder to get to/from so we decided on Norwegian Air instead. By that time of night, none of the standard airport buses or coaches seemed to be running but I discovered that there is a train station pretty much inside the airport, and although standard trains also appear to stop by that time of night, there is a special train called 'Flytoget' which is an airport express train that takes you into Oslo city centre (Oslo S is the stop name) in around 20 minutes. They are every 20 minutes in the late evening and stop running at 12:50am so are a really great option for those pesky late arrivals. 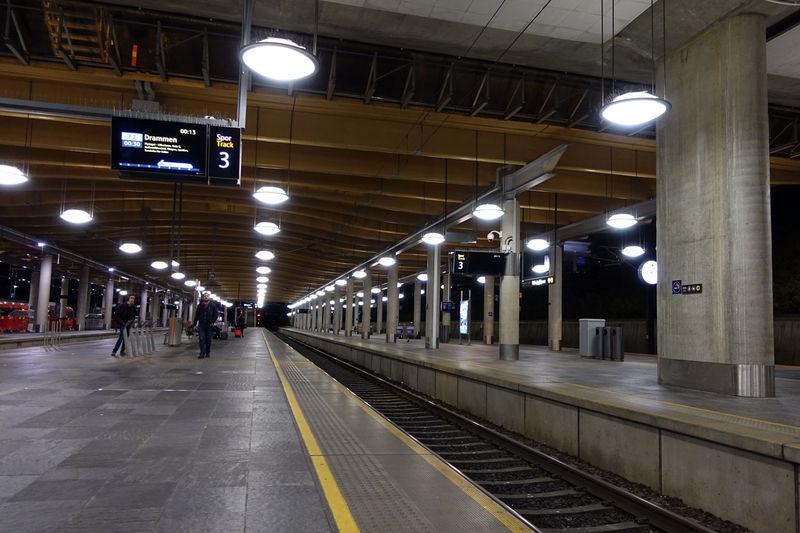 When we got into the arrivals area, there were sign-posts all over the place for the train station. We simply followed these and found the trains very very easily - they are actually in the terminal building itself and you don't need to go outside or walk far at all. You have two main options for getting a ticket (180 NOK at time of writing). Either you can buy a ticket at the kiosks outside the ticket barriers (you cannot miss them and helpfully they have an English option) or you can simply swipe your bank card at the ticket barrier itself and then swipe again when you exit at your desired station and it'll charge you the right amount. I think there is also a FlytoGet app where you can buy tickets in advance but this isn't something we investigated at all. Then it was down to the platform to wait for the train (there are big screens at the ticket barrier which tell you which platform the FlytoGet train is leaving from). The station was very clean and safe-feeling, we were very impressed! 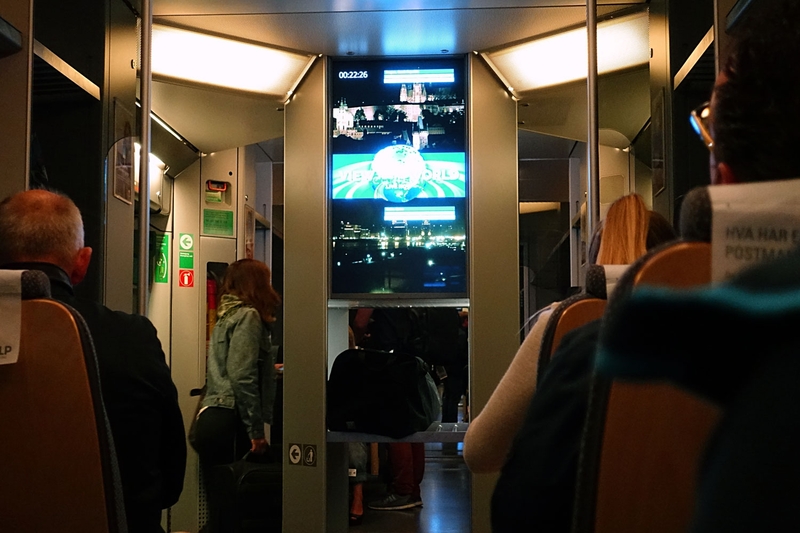 The train itself was lovely and surprisingly full for that time of night, there were big screens in the train as well and it was easy to keep track of where you needed to get off. 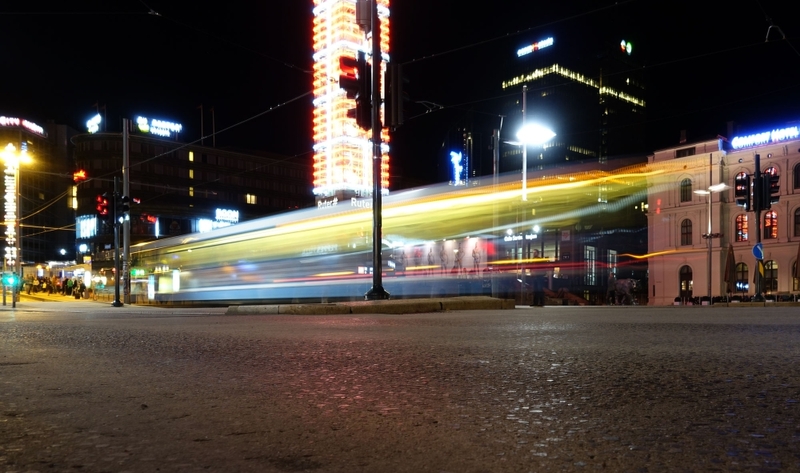 All in all the trip from Gardermoen Airport to Oslo city centre was very painless and easy, even very late at night so if arriving super late is the only option you have - don't let that put you off - we would definitely do it again!